Hermann Ohme started constructing his porcelain factory in 1881 in a direct neighbourhood of the railway station in Sorgau (Solice Dolne, later incorporated into the area of Szczawienko) on the plot of land with the address of 10 Waldenburger Strasse. Most probably, the financial means for the construction came from a part of the heritage left by Carl Krister to Ohme’s wife. Outfitting the factory and putting it into operation was a task of Ernst Maria Bauer, a young engineer. As soon as in 1882 the factory was ready for opening. Originally, the offices of the firm were located in Wałbrzych, later, on 1 April 1893, they were moved to Sorgau. The factory in Sorgau started its production equipped with two burning kilns. It was developing rapidly, and at the turn of 1886 and 1887 it employed 250 workers, but in 1891 there were already 326 people, including 126 women. The porcelain burning kilns were powered with gas from a gas firm which belonged to Hermann Ohme’s wife. Within the first years of the factory’s operation, one of co-workers was Hugo Völker, a modeller from Plaue in Thuringia, who died in Sorgau in 1889 at the age of 67. At first the firm offered coffee and tea services, tableware and breakfast services, as well as sanitary porcelain of German, English, and French design, and also flower vases, accessories for smokers, candlesticks, and other items. A speciality of the factory was manufacturing of unusually thin vessels. The factory had its own painting study and a printing room. Attracting customers and promotion of products were dealt with by pattern stores and agencies in Berlin, Hamburg, and London. Moreover, Ohme’s factory took part in fairs in Leipzig. In 1891 the factory won international appreciation for the first time when it was given the first class honorary diploma in London. On 1 January 1894 Hermann Ohme made Ernst Maria Bauer a co-owner of the factory within the range of a general partnership. In 1909 the partnership was joined by Hermann Alfred, Hermann Ohme’s son, as a next shareholder. When in 1895 Carl Tielsch’s porcelain factory in Altwasser (Stary Zdrój) struggled for a longer time with a workers’ strike, Hermann Ohme’s factory, together with the manufactures in Jaworzyna, Jedlina, and Stanowice, declared that for the period they are ready to supply Tielsh with any amount of porcelain at cost. Items marked with the signs of both Tielsch and Ohme come from the period. In 1904 Ohme’s factory won a gold medal at the exhibition in Wrocław and a gold medal at the world exhibition in St. Louis, where special attention was attracted by the special overglaze decorations and interesting patterns. In 1907 the Association of German Factories of Porcelain Vessels introduced a classification of factories according to quality and prices. 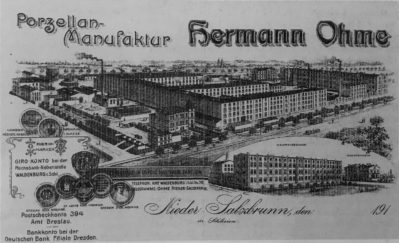 The third class, marked the highest, included only eight factories – apart from four Bavarian manufactures (C. M. Hutschereuther’s in Hohenberg, Lorenz Hutschenreuther’s in Selb, Philipp Rosenthal’s in Selb and Kronach) there was also Hermann Ohme’s factory. When one more class was introduced, the fourth and the highest one, Ohme’s factory was also listed there together with ten other factories chosen for this class. Such a high rank was a result of the fact that the factory produced applied items of various kinds, according to designs created by artists, and the porcelain was characteristic for its special delicacy and beautiful decorations, which made it able to compete with leading factories in Germany. Before World War I the factory employed about 400 workers. International sale was dealt with not only by the large export department, but also by pattern stores and agencies in London, Paris, and Smyrna. Foreign agencies of the firm attracted numerous customers, as before World War I the factory specialized in production of luxurious porcelain of Sèvres and Dresden style, which was fashionable at that time. After Hermann Ohme’s death in 1921, the general partnership, which the factory had been so far, became terminated. The porcelain factory and the neighbouring gas plant, which belonged to the family, became a property of inheritors. The manufacture stayed in charge of Hermann Alfred Ohme, Hermann Ohme’s son, and standing by his side executives – A. Staedler and Carl Greiner. Soon after ownership changes in the factory, there was the period of inflation, which was a result of World War I. 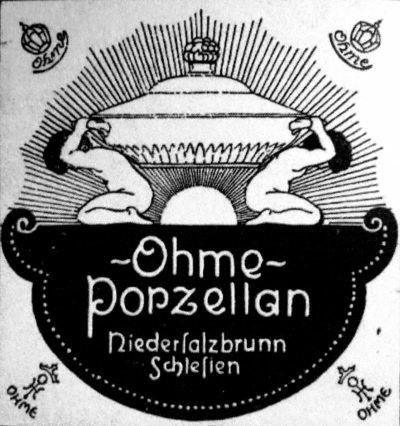 As numerous communes and enterprises in Germany, also Hermann Ohme’s porcelain factory issued substitute money. The highest nominal value of 10 and 50 billion marks come from November 1923, the climactic period if inflation. The firm struggled to overcome the deficit of flats after World War I, cofounding a housing co-operative in Nieder-Salzbrunn, and also offering flats belonging to the firm into the disposal of the employed workers and office employees. A maiden’s house was founded, where non-resident single and widowed female workers could live. The workers were also given seven morgens of land (17500 m2) for farming. In 1925 the firm changed its legal form and was transformed into a limited partnership – the general director was still Hermann Alfred Ohme, A. Staedler was the commercial director, and G. Seiler was the technical director. In the half of the twenties of the 20th century in the factory there were eight kilns in operation, including one which was used for burning the unusually popular cobaltic porcelain. The factory had a painting study, printing room, and a modern aerography study. At that time the factory employed from 350 to 400 workers. It produced first of all tableware, coffee and tea services, cups for mocaccino and collectible cups, fruit dishes with various decorations, vases, bowls, and boxes. 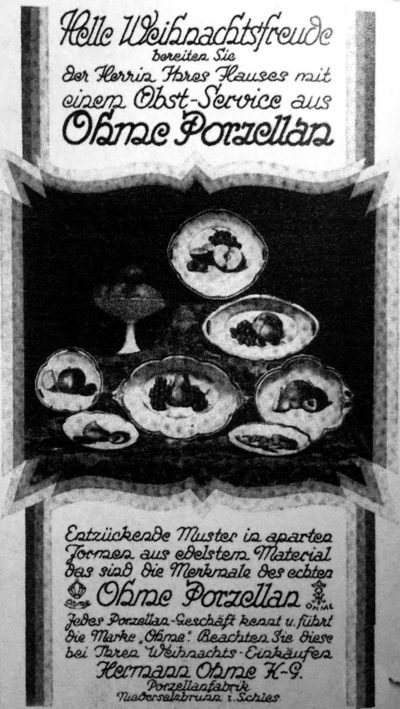 From 1923 Hermann Ohme’s factory, similarly as for instance state manufactures in Meissen and Berlin, or Rosenthal’s factory in Selb in Bavaria, produced also Christmas plates. Their peculiarity was based on presenting only motifs of Silesian foothills. For example, on the plate from 1925 there was the Vang Church in the Karkonosze mountains, and from 1928 – the Śnieżne Kotły (Snowy Cirques) with a mountain lodge. All the designs of Christmas plates were made by Hermann Gradl from Nuremberg, the German painter, drawer, and illustrator. In co-operation with the well-known Websky, Hartmann & Wiesen A.G. textile factory from Wüstewaltersdorf (Walim), a locality located in the district of Wałbrzych, Ohme’s factory offered tablecloth to match to be purchased together with its own products. A new showroom at the strolling hall in the nearby health resort of Bad Salzbrunn (Szczawno Zdrój) was to activate local sale and popularize the factory’s output among rich customers. By means of widening the range of agents’ network, the effort was made to gain new markets for export. Apart from shops in London, others were founded in Amsterdam, Barcelona, Milan, Oslo, Stockholm, and Rio de Janeiro. However, the main receiver of porcelain was the United States. In 1928 the factory took part in the ‘German Porcelain’ exhibition in Wiesbaden. In the exhibition catalogue the firm showed its tableware and coffee services decorated with gold or cobalt, fruit dishes, vases, Christmas plates, as well hotel porcelain. In 1929, the year of the Great Depression, for the reason of problems with sale, the factory had to dismiss 200 workers. In 1930 bankruptcy was declared and after 50 years the production was terminated, first of all for the reason of decreasing demand for high-quality porcelain. The life’s work of Hermann Ohme became a victim of the world economic crisis. Ohme’s patterns were taken over by the porcelain factory of August Schweig G.m.b.H. from the locality of Weißwasser (Biała Woda, Upper Lusatia), which sold them with more modern decorations.